Sunday dawned moist and damp as John A and I arrived in the Palm Bay area of Margate. Exactly what we'd wanted. 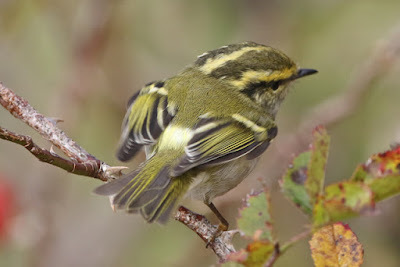 Getting out the car we were greeted by some Redwings fresh in, and as is typical of this autumn, copious amounts of Goldcrests. Lovely birds, just a shame that sometimes they're so common! A walk around the scrub for the first couple of hours of light was great; a morning where it was decent to be alive if lacking the cutting edge. A few Bramblings over, and one in the coastal scrub, along with Siskins and Redpolls; plus thrushes, Reed Buntings and Meadow Pipits all coming in from the North Sea. When the viz mig dried out, we retreated the short distance to Northdown Park. There must have been several hundred Goldcrests here, and looking high up in the canopy takes its toll. This wasn't before we located a very vocal Yellow-browed Warbler in the southwest section - embarrassingly without much coastal birding and too much gulling, this was my first of the autumn! Several Chiffchaffs were here too. 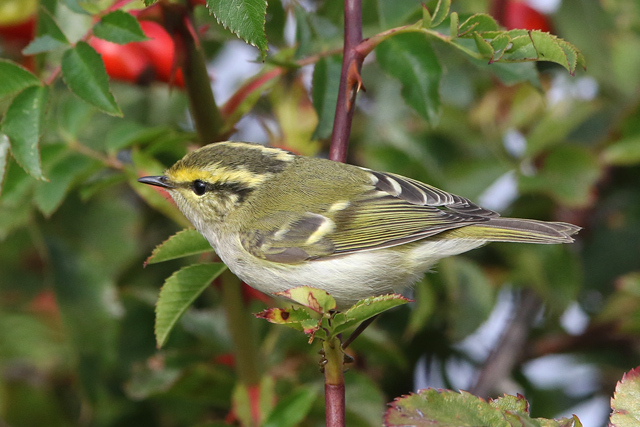 With tiredness kicking in, and needing to get back to London for late afternoon, we headed back west and stopped in at Seasalter on the off chance that the Pallas' Warbler seen earlier in the day was still about. And sure, despite no updates since early morning, it provided me with my best views ever of this species.